Women played an important role in the village economy. 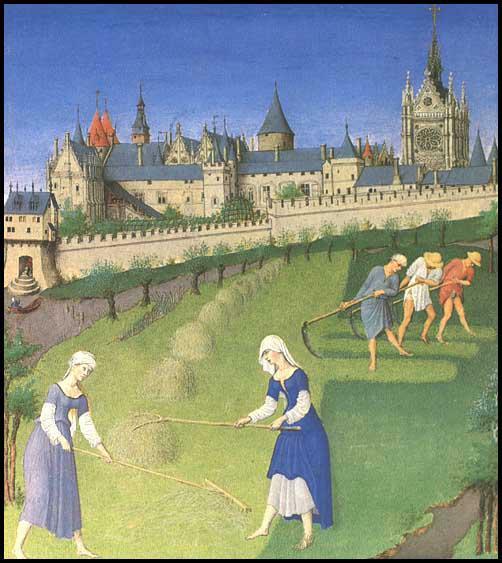 As the men had to provide the labour services by working several days a week on the lord's demesne, it was the women who had to look after the family crops. Women not only laboured in the fields. They did most of the sheep shearing and were usually in charge of the garden where they grew vegetables and kept a few chickens. Women also made the cloth, cooked the food, and looked after the children. As well as supplying the needs of their families, women were often involved in producing goods for sale. It was they rather than men who were more likely to produce bread, beer or clothes to be sold to other members of the village. On the death of her husband, a woman was entitled by law to take over a third of his holding. In some villages, women who were able to pay the entry fees to the lord, were allowed to carry on farming all the land. Despite the fact that women contributed so much to the village economy they did not have the same rights as men in the village. For example, women were not allowed to be appointed to official posts such as bailiff, reeve, constable or aletaster. 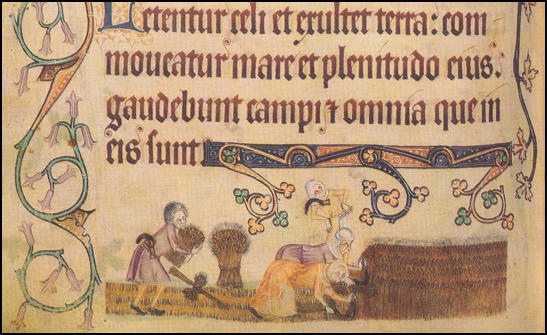 (Source 1) Illustrated manuscript from the late 12th century. Margery, the widow, holds 24 acres and she pays 3s every year... From Michaelmas to the Feast of St Peter she must plough half an acre every week... And from the Feast of St John the Baptist until August she must perform manual service 3 days every week... She shall mow the lord's meadow for at least 4 days... And she must lift the lord's hay for at least 4 days... She shall weed 2 days... And from the Feast of St Peter until Michaelmas she must perform manual service 5 days a week... And furthermore she performs 8 boon works in autumn... And she shall give eggs at Easter at will. She (the lady of the manor) should be a good manager, knowledgeable about farming, knowing in what weather and in what season the fields should be worked... She should often take her recreation in the fields in order to see how the work is progressing, for there are many who would willingly stop raking the ground beyond the surface if they thought nobody would notice. 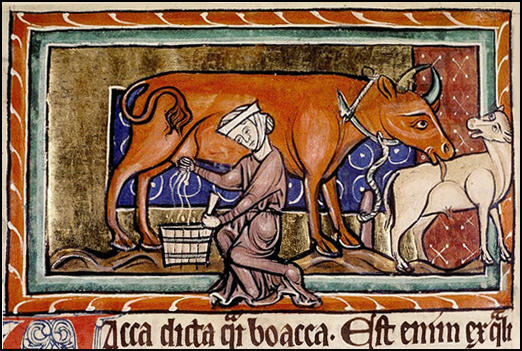 There were relatively few cows in the Middle Ages, for they needed a great deal of fodder and it was difficult to meet their needs in winter. As a rule, their butter was made into cheese and more rarely butter. A 13th century writer said of a milkmaid's work, "A milkmaid must be loyal, have a good reputation and make sure of cleanliness." If the husband has sheep of his own, then his wife may have some of the wool, to make her husband and herself some clothes... she may also take wool to spin for the cloth makers. That way she can earn her own living, and still have plenty of time to do other work... It is the wife's occupation to winnow corn, to make malt, to wash clothes, to make hay and to cut corn. In time of need she should help her husband fill the dung-cart, drive the plough, and load the hay and corn. She should also go to the market to sell butter, cheese, milk, eggs, chickens, pigs, geese and corn. And also to buy the things needed for the household. haymaking. Women everywhere tended their children, milked their cattle, tilled their fields, washed, baked, cleaned and sewed, healed the sick, sat by the dying and laid out the dead... The extraordinary continuity of women's work, from country to country and age to age, is one of the reasons for its invisibility; the sight of a woman nursing a baby, stirring a cook-pot or cleaning a floor is as natural as the air we breathe... 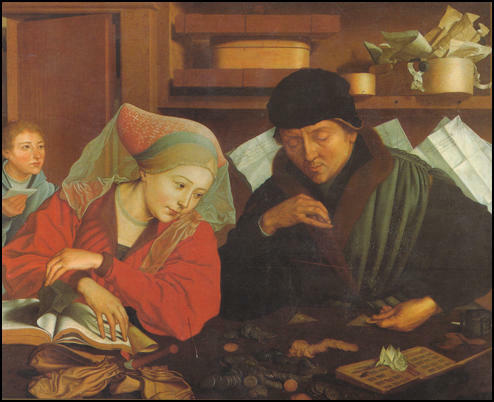 While there was work to be done, women did it, and behind the vivid foreground activities of popes and kings, wars and discoveries, tyranny and defeat, working women wove the real fabric of the kind of history that has yet to receive its due. Ruling class women were increasingly treated as an ornament, a source of sexual pleasure or as a breeder of heirs. They would be protected from hardship and external dangers, but also cocooned from any interaction with the wider social world. 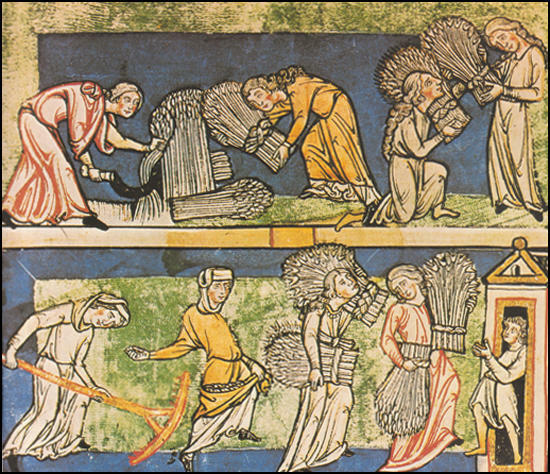 Life was very different for women in agricultural or artisan households. They still had a productive role and were engaged in endless toil. Nevertheless, it was their husbands who controlled relations between the household and the rest of society, imposing on the women and children the measures needed to ensure the household's survival (including successive pregnancies for the wife). It is evident from a brief survey of contemporary documents, that no woman was expected to remain long unmarried, and both legislation and local custom assumed marriage as the natural state for everyone of mature age. Since in all feudal society the superiority of men was unquestioned, and popular opinion recognised marriage as inevitable, women very easily came to look on matrimony as part of the scheme of things. Probably the idea that a woman had a right to remain single, unless she entered the cloister and became the bride of Christ, or to select her own husband, was unthinkable at that time. Women were an essential part of the harvest team. But their work was not limited to the special effort required at that time of the year... Women worked in the fields at gleaning, turnip-pulling, hoeing, weeding and in all kinds of fruit and vegetable picking. In some jobs the children worked alongside their mothers. The villeins... in the common fields, were the pivot around which the whole life of the manor revolved. Their services were regularised and most often increased after the Norman Conquest. They were of two kinds: day work, and boon work. Day work was performed on a regular number of days a week, usually three. Boon work consisted of extra labour which might be demanded at any time. It was the most disliked of the two, and the harder to get free from, since it came at times, such as harvest and sheep shearing, when the serf's work was most needed both on the lord's domain and on his own land. It is clear from the amount of labour services due from the villein that the bulk of the work in his own holding must have been performed by the other members of his family. Question 1: Study sources 1, 3, 6, 9, 11 and 13. Describe the work these women are doing. Why do you think most of these women have their heads covered? 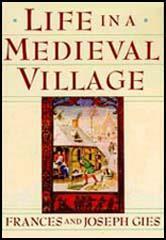 Question 2: Select passages from the written sources in this unit to show that women worked very hard during the Middle Ages. Question 3: What type of sources would a historian need to study if he or she wanted to write a book about the kind of work women did in the village? Question 4: Do you think that everyone who was alive in England in, say 1340, had an equal chance of being known about today? Use your knowledge of the sources available for this period to answer this question. Question 5: Sources 4 and 7 are both taken from books that gave advice on farming. 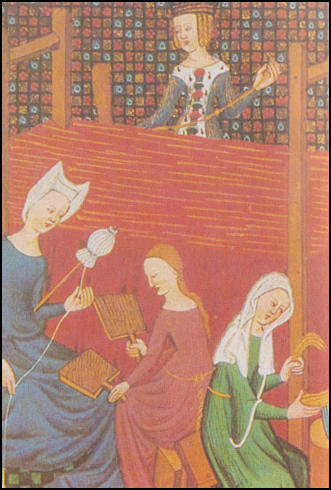 Historians would use sources such as these to discover the kind of work that women did during the Middle Ages. Why is it difficult for a historian to obtain detailed information about the work of women from books like these?